Very interesting Chris. We have had similar experiences with blackbirds patiently waiting for food each morning just outside the glass doors. Other birds wait on trees for feeders to be replenished. 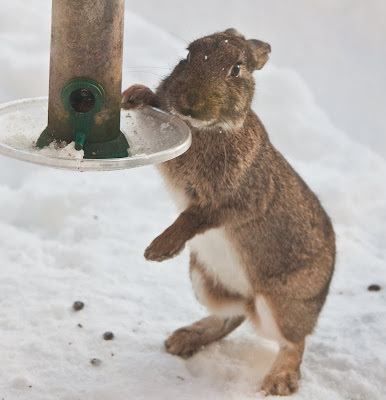 It really has been desperate this winter for all wild life. One blackbird followed me into the house when I'd failed to provide food and had gone back inside to get something. I think this sort of thing is wonderful! Thanks for sharing, as they say! Brilliant! Lovely write up of you relationship with the bunnies! We have two domestics but we still love seeing th wild ones, we drive round and round roundabouts in Manchester looking at them. There is one roundabout in Trafford Park industrial estate that in the summr has about 30 rabbits and a dozen hegdehogs just sat munching on the grass every night! We've had plenty of birds in the garden and spent more on their food than our own I think in recent weeks. The Blackbird is still the boss of the garden, until the Grey Squirrel turns up! Down here the big thing has been the Fieldfares. we had a fantastic looking Thrush too. Love the bunny photo! A great post and an entrancing photograph! Many thanks for both of them. I'll be buying a couple of new feeders today, I think.